YOUNGSTOWN, Ohio – When you poke your head through the small window to place your barbecue order at the Space Kat, don’t ask owner Jack Zizzo if he makes his own sauce. He does, but that’s beside the point. “[Sauce] isn’t the definition of barbecue,” he says with some exasperation. Zizzo cooks what he calls, “authentic, central Texas-style barbecue” out of the small kitchen in the back of the Draught House in downtown Youngstown. 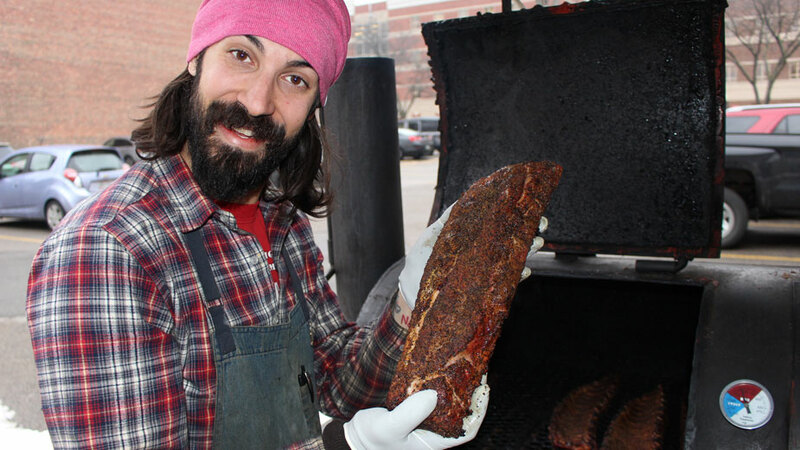 Jack Zizzo, owner of Space Kat, serves barbecue prepared using his custom-built smoker. The restaurant, which opened in October 2017, is open from 4 p.m. to 10 p.m. Wednesday through Saturday. About 75% of business is eat in, with customers placing their orders and eating their meals inside the Draught House. “The intention, when we started out, was not to be a barbecue place. We had a diverse menu and we just used the smoker a lot,” explains Zizzo. For a while Space Kat served barbecue by-the-pound on Saturdays, until staffing issues forced Zizzo to abandon the idea. Soon after, customers began demanding he put it on the menu. “I kind of just said, ‘if you want barbecue I’m going to do it everyday,’ ” he recalls. Behind the building, under a tarp, is his custom-built smoker, where he cooks all of the meat Space Kat serves. He an Andrew Euonavolonta, his only employee, check the smoker constantly, adding wood when necessary to ensure everything is cooking properly. “Right now we have beef tri-tip,” says Zizzo. The menu also includes baby back ribs, pulled pork and hot links. “We use the trimmings from the beef and pork to make our sausage. So we’re trying to be sustainable in that sense,” Zizzo says. A Youngstown native, Zizzo spent six years cooking and studying in Brooklyn, Los Angeles, “and Austin Texas,” he says with pride. While in Austin he attended Escoffier culinary school and “met a really talented pit master and he took me under his wing,” he says. That pit master was John Lewis, the owner of Lewis Barbecue in Charleston, S. C., who for years was the right-hand-man of barbecue legend Aaron Franklin. Texas-style barbecue uses only a dry-rub and smoke to flavor the meat. No sauce. Zizzo breaks with tradition a bit by serving two sauces, a sweet and a tangy, though they always come on the side. “As far as ingredients go you have three key elements: Salt, pepper and oak wood,” he explains. This summer Zizzo plans to get another smoker, which he says will allow him to expand the hours Space Kat is open. Euonavolonta, who attended the culinary institute of Pittsburgh, says they’ve just about maxed-out the capacity of their single smoker. “Week days can be hit or miss but for the most part selling out has been a trend,” he says. Since last February was slow for business Zizzo plans to close Space Kat for the month and reopen in March. As for future expansion, Zizzo isn’t ruling anything out, but says, for the time being, he wants to keep the operation small.